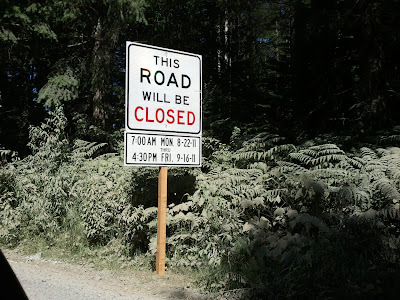 If you are looking to head to Bare Mountain or other recreation along the North Fork Snoqualmie River, be aware that the North Fork Rd SE will be closed starting tomorrow August 22nd through September 16th. Crews from the King County Road Services Division will begin installing a large culvert underneath the roadway on North Fork Road Southeast near North Bend beginning Monday, Aug. 22. The road will be closed through Sept. 16 approximately two miles beyond the end of the paved portion. Also, work continues on the big Novelty Hill Road project east of Redmond, with a full closure of Novelty Hill Road scheduled for Aug. 26-28. Other work will cause intermittent lane closures Monday-Friday from 9 a.m. to 2 p.m. on Northeast 95th Street and on 195th/196th Avenue Northeast.